Taken for granted daily, breathing is one of those things we just forget to do throughout the day. This is mostly because it’s an automated function of the body so there is really no need to think of it. But this is the wrong way to look at the “One” thing that is responsible for every aspect of our being. Breathing exercises have been proven by the Western science community to have many benefits and has been used for centuries by the Eastern cultures as a way of staying connected to the infinite energy that surrounds us. These are just 10 of the innumerable benefits of including breathing into your daily routine. Improvement in the quality of the blood due to its increased oxygenation in the lungs. This aids in the elimination of toxins from the system. Increase in the digestion and assimilation of food. The digestive organs such as the stomach receive more oxygen, and hence operates more efficiently. The digestion is further enhanced by the fact that the food is oxygenated more. Improvement in the health of the nervous system, including the brain, spinal cord, nerve centers and nerves. This is due again to the increased oxygenation and hence nourishment of the nervous system. This improves the health of the whole body, since the nervous system communicates to all parts of the body. Rejuvenation of the glands, especially the pituitary and pineal glands. The brain has a special affinity for oxygen, requiring three times more oxygen than does the rest of the body. This has far-reaching effects on our well being. Rejuvenation of the skin. The skin becomes smoother and a reduction of facial wrinkles occurs. The movements of the diaphragm during the deep breathing exercise massage the abdominal organs – the stomach, small intestine, liver and pancreas. The upper movement of the diaphragm also massages the heart. This stimulates the blood circulation in these organs. The lungs become healthy and powerful, a good insurance against respiratory problems. Deep, slow, yoga breathing reduces the work load for the heart. The result is a more efficient, stronger heart that operates better and lasts longer. It also mean reduced blood pressure and less heart disease. The yoga breathing exercises reduce the work load on the heart in two ways. Firstly, deep breathing leads to more efficient lungs, which means more oxygen is brought into contact with blood sent to the lungs by the heart. So, the heart doesn’t have to work as hard to deliver oxygen to the tissues. Secondly, deep breathing leads to a greater pressure differential in the lungs, which leads to an increase in the circulation, thus resting the heart a little. 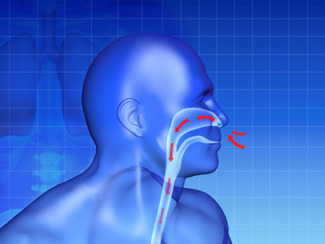 Deep, slow breathing assists in weight control. If you are overweight, the extra oxygen burns up the excess fat more efficiently. If you are underweight, the extra oxygen feeds the starving tissues and glands. In other words, yoga tends to produce the ideal weight for you. Relaxation of the mind and body. Slow, deep, rhythmic breathing causes a reflex stimulation of the parasympathetic nervous system, which results in a reduction in the heart rate and relaxation of the muscles. These two factors cause a reflex relaxation of the mind, since the mind and body are very interdependent. In addition, oxygenation of the brain tends to normalize brain function, reducing excessive anxiety levels. < Previous Why more men should do Yoga.